In one of my past lives - before I took up knitting - I was an origami enthusiast. 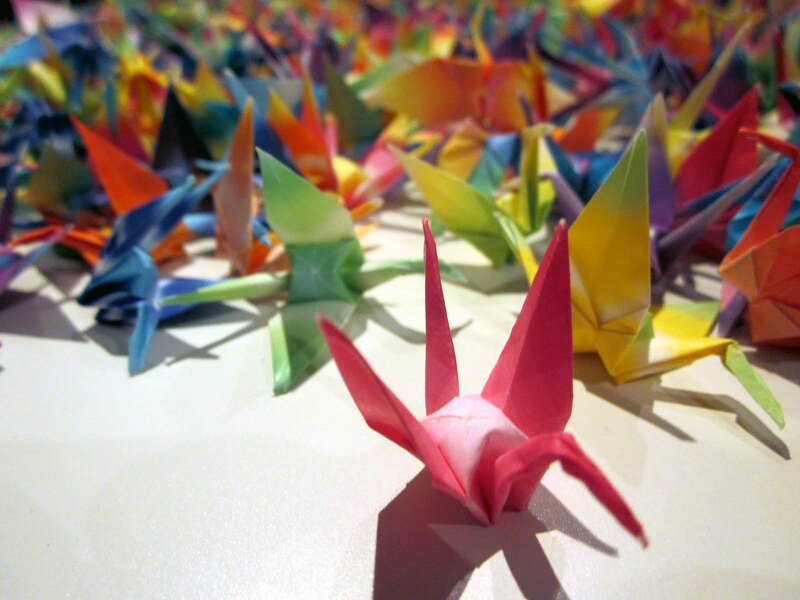 Origami was not only my habit and hobby of choice, it was something of a lifestyle. It kept my hands busy through the last days of my second post-graduate degree - a Master's in Library and Information Science. I would fold birds and butterflies all lecture long. The year was 2004. I left a trail of origami wherever I went - at my seat in the classroom, on the table in the pub, around where I was sat outside. I grew used to the calls of "Wait - don't you want these?" from lecturers, friends and servers alike. Of course I didn't - they were a renewable resource. I could always make more. Sometimes I would save up a bunch of them and purposefully place them en masse in some poor, unsuspecting corner of the building or grounds. from what I understand, people loved it - it made them happy to turn a corner and find a railing or a shrub alive with paper birds and bugs - which in turn made me happy. If a few folds of a fancy piece of paper brought this much joy, how could I say no? At night, when I'd return to my lair in London - Ontario, of course - I would sit down and work on the ultimate origamist's project - folding 1000 cranes. I had bought a special box of paper just for this purpose. It took me a while, but I eventually did it. At which point I started working on my second thousand cranes, which never completely panned out. I think I stopped somewhere around 1100 or so - I haven't counted them in a while. My point, though is this - I've been living with my thousand cranes for quite some time now, and it's time for them to fly off to live with one of you. My offer is simple - pay only the shipping to get the 1000+ cranes from here to where you live and they are yours. If you are interested, please comment below - first come, first served. I don't know how much shipping would cost to get it to Chicago, but I'm looking at all of the pretty colors and thinking - hmmm....pretty curtains for my studio. September 20, 2011 at 9:57 a.m.
Let's say $12 USD. Say the word and they are yours! September 20, 2011 at 10:03 a.m. There is a project to collect paper cranes for Japan after the earthquake. A link might mark my comment as spam, but you can google Paper Cranes for Japan to read about it. 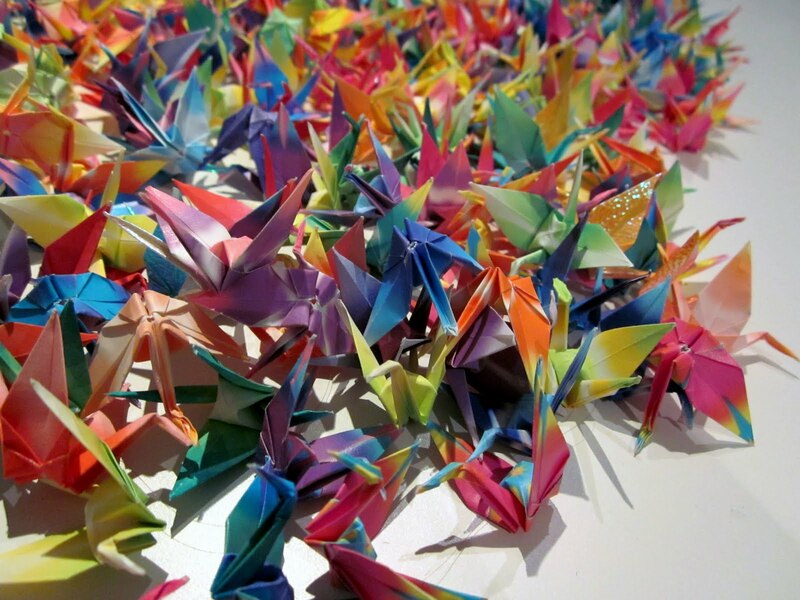 They received over 2 million cranes! September 20, 2011 at 10:41 a.m.
September 20, 2011 at 10:47 a.m. I totally love the colours and idea, but I live and travel on a boat, currently in Florida and if I ordered these it might put my husbner (http://www.sailblogs.com/member/closeknit/) over the edge. He already moans about the yarn stash. September 20, 2011 at 11:08 a.m. I would pay the 12 or so buck to ship then to new york and make mobiles out of them. September 20, 2011 at 12:23 p.m.
if you need a back up for a back up, I'd love to have them! September 20, 2011 at 3:14 p.m.
September 20, 2011 at 3:59 p.m.
Littlegreenpixie - sold! Please send your address to spillyjaneknitsATgmailDOTcom and I will send you an invoice for $12 USD via PayPal. Thank you! September 20, 2011 at 4:07 p.m.
Can't wait to see the curtain! September 21, 2011 at 12:46 p.m.
My brother in law was exposed to the A-bomb detonation in New Mexico fifty or so years ago, when he was 18 and in the Marines. (He, and his entire troop, later developed various cancers from the exposure and all died from them.) 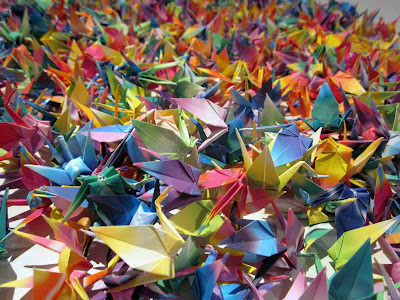 He visited and taught in Japan and made a friend there who after hearing of his cancer, folded 1000 paper cranes wishing for a cure. Unfortunately he died last October, but he had those cranes hanging in bound loops from his bedside cieling, looking much like a giant exotic colorful flower and they gave him great joy. September 21, 2011 at 6:29 p.m.
September 23, 2011 at 11:20 a.m.
Littlegreenpixie - please contact me at spillyjaneATgmailDOTcom to arrange payment and shipping for the cranes. If I don't hear from you by the end of Tuesday, 27 September, I will open up the offer to the next commenter who expressed interest in the cranes. September 25, 2011 at 7:31 a.m.
Just sent the second email! There must have been a problem with the address of the first. September 26, 2011 at 6:29 p.m. I love the cranes...If I turned a corner and there were multitudes of cranes, I would have a good day from that point on for sure! October 3, 2011 at 3:19 p.m.